…Dark and Deep. The news series, ‘Frozen in Amber’ is a journey through my travel pics. A picture. A memory. A ripple in my heart. You pay a fee at the forest office in any ecotourism spot in Kerala they will provide you a tribal guide. “You have already paid for the man. 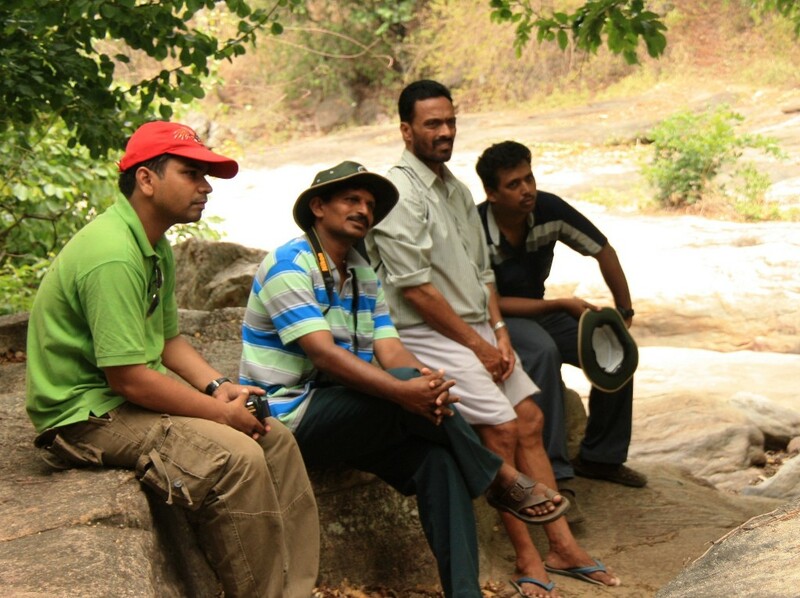 No tipping needed,” the officer at Chinnar forest division warned in whispers taking us out of the earshot of our guide. We nodded. The 3-hour trek inside the woods was long and hard, but Shaji made the tiring time fly as he limned the way trees, animals and people live side by side. He had a shrill, funny voice. “Tell us about you, Shaji.” He went silent. Only the sound of a machete swishing against the riotous undergrowth remained ahead of us. Perhaps Shaji was running his life in his mind, desperately searching for a head and a tail in the inchoate mess of his story, so that the illiterate, insensitive tourists, who wanted to know what life in a forest felt like, might understand. Sorry. Shaji would not talk about himself. The long silence that followed made it clear. The lethargic brook which stringed along on our left waxed and waned as we trudged. One could cut across to the other side leaping through that scattering of boulders which seemed like half-submerged hippos, thrusting their shiny backs over water. Monkeys were screeching apocalypse from trees on the opposite banks. At one point we caught a couple of men scantly dressed – with their upper torso shining like copper in the sun – scampering away from the other side of the river as they saw us approach. Abandoned on the shore were a few long branches shaped into poles, with their twigs and leaves shaven off: some crude fishing rods they had been using. Shaji stopped and gazed across with a withered look. “They took me for a forest guard because of this uniform,” he pulled his misclad olive green outfit with white dots which loosely hung about him. His shirt and trousers had seen many rough weathers, one could see. “Fishing is banned inside the forest,” he squealed like a rat. We chuckled at the way Shaji terrified his own men, with a voice like this. “No, it is none of your matter,” he snapped back. No beating about the bush. No polish. Just a curt no. I walked aslosh with shame and a little anger. This is bad manners. Can a guide be this uncooperative and arrogant! We must put in a complaint against him once we get back to the forest office; my friend jabbed my ribs and told me in low voice. “It is deep inside the forest. It would take half a day to reach there,” he said two minutes later as if our anger had strayed into his airspace and pricked his conscience. Well, this would compensate for the hurt. “Then how do you manage to work here as a guide? How do you come everyday?” We sat on a large rock to catch our breath. “I start from my home at 5am.” Shaji, 23, unmarried wakes up at 4, prepares tea for his bedridden father and starts on an empty stomach. If he leaps and bounds through the woods with enough speed, skirting elephant tracks, bisons and snakes in the wee-hour-darkness he might connect with the first customer at the Chinnar office at 11am. Once at the office, there wouldn’t be time for a second tea. “You should always be good to those people who take you as guide,” the officer’s warning rings in Shaji’s ears, as he welcomes the tourists. Three hours of intense trek begins. Shaji must play back the same tape – describing, pointing, demonstrating – day after day to customers, spirited, wearied and bored. Late noon after work, Shaji bounds back home through the woods clutching a few soiled notes tight in his palm. The glass of tea he had in the morning could have long evaporated from his blood. He runs pinched by the biting hunger. He knows, warm meals wouldn’t be waiting at home for him on the table. No mother would run her spindly fingers warm with love through Shaji’s sweaty hair, as he nibbles at his food. “I wash the rice the moment I reach home,” he told us, with a smile. His father too tired with hunger now waits in his bed for the smell of cooked rice to waft up from the boil. 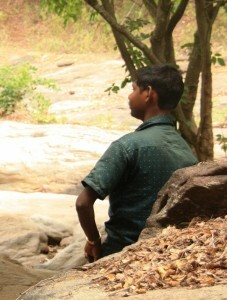 He has only a distant memory of a black tea Shaji gave him in the morning. I felt his pain and strain. But hunger.. I won’t waste food anymore.